Alternate view of bright livingroom area with plenty of windows. Dining area w/French doors out to deck and patio entertaining. 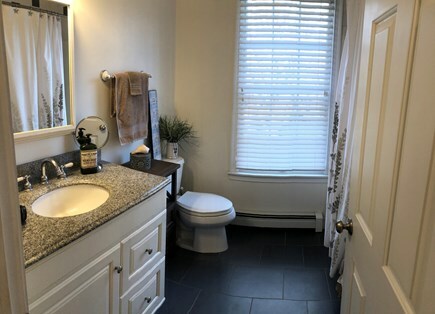 2nd Full bath on 2nd floor with tub/shower combination. Well appointed and sunny 4 bedroom 2 1/2 bath, two Story Home with all the extras to make your summer stay comfortable & memorable! Lots of windows for a bright & lively living environment create the perfect setting. Everything from the fully applianced kitchen and artisan bamboo flooring, to the large master suite with jacuzzi will make your stay more than just comfortable! A 2nd large Master bedroom with matching twin makes this the perfect house for two families to enjoy. Situated on a private cul-de-sac, this home is perfect for children. A short walk to Pleasant Street Beach with white sand, bathroom facilities, lifeguards, daily stops from the ice-cream truck, and fabulous panoramic views. The beach has a jette where those fishing enthusiasts can enjoy hooking local varieties of fish. Complete Beach accessories provided along with a carting wagon for convenience. The quaint, historic town of Harwichport and picturesque Allens Marina is just a short bike ride or walk away. Enjoy & relax in Style! This is the perfect house for 2 families to enjoy. Lots of room to spread out and just relax. Very large and gorgeously landscaped yard for kids to play and adults to relax. We have sold out each season since 2004 and it's wise to plan early and reserve your time! Our past families have all loved their stays in our home as it has every possible amenity for a very comfortable stay. 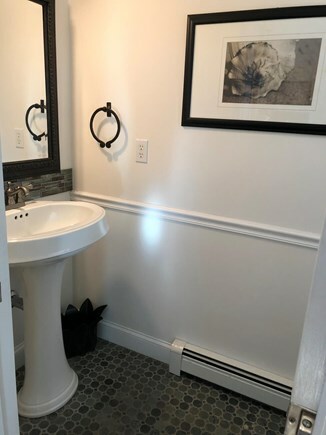 We take pride in our home and make sure that every detail is addressed! There are no dark, pine-paneled walls here - the house is bright, inviting and exudes ''Ocean Retreat'' from your first steps inside! The decorating was done in true 'Coastal living' style. This, we know, makes a big difference from rental home to rental home! So come kick your feet up, sip your drink of choice and breathe in the clean coastal air as your memorable Cape Cod vacation begins. Coming for 2019 pre-Summer completion: New & Expanded outdoor patio for entertaining & relaxation with integrated Fire Pit gathering area. For additional information and photos, email us. Additional availability info: Call Jane Ferri (401) 413-5317. This is a Saturday to Saturday vacation rental. Additional pricing info: Linens not provided / Cleaning Fee $185 Additional, State and local taxes of 12.45% will apply. My family has been renting this house for the last 6 years and have loved it every summer. The location is great for kids with a very safe cul de sac and dead end street around the house. It's a very short walk to the beach and quick drive to town. The house is well maintained and has a nice back porch for cooking and eating. We're looking forward to our trip again this summer. We have been renting this home for 8+ years and each year seems better than the next. The property always seems to have a yearly upgrade. 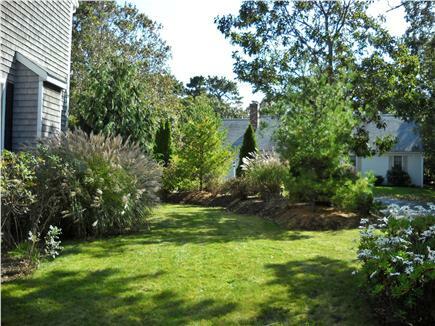 Centrally located to town, restaurants and Nantucket Sound Beaches yet far enough away for privacy and quiet. Spacious home with a great deck and backyard. Our family has made this property our Cape Cod summer destination! It’s always such a pleasure to host your family for several weeks Greg. We feel blessed to be a part of wonderful family memories through our home. Thank you for allowing us that privilege each year. An annual tradition for our family. The house is great and we love the location. A quick walk to the beach and the cul de sac is excellent for the kids to play. Owners are very nice and always checking to make sure everything is perfect. We hate to leave each summer and are quick to book for the following summer. Our family has been renting this property for 10 years, and it's the only house we will rent on the Cape. This house is amazing with just a short walk to the beach. Safe for children as it is on a quiet cul-de-sac. The owners of the house are thoughtful, attentive, and so easy to deal with. The house is kept meticulously. We strongly recommend renting this house. Our family rented this house for 2 summers and absolutely loved it. It fit our needs perfectly as it was modern, open concept, filled with amenities, and most important it was walking distance to the beach! My husband and I had a 6-month-old the first summer we rented. The 4 bedrooms were perfect for visiting family and separate sleeping for the baby. The deck and patio were perfect for stay-at-home dinners and grilling. The master-suite was fabulous, made us feel as though we were in a posh hotel. The a/c, washer-dryer, dishwasher and 3 bathrooms made for a very comfortable stay! Also, walking distance to the beach was just what we needed with all our baby gear and frequent trips back to the house for necessities. We loved it so much we rented a second year! We'd highly recommend this rental to any family as it is super spacious and convenient, and the owners, Jane and Steve, couldn't be more accommodating. 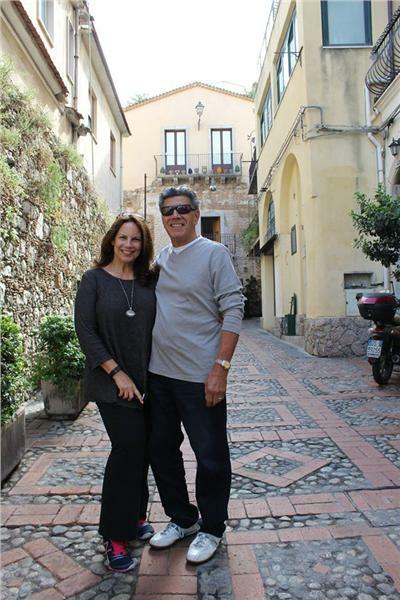 Steven & Jane Ferri have been renting their Harwich home since it's completion in 2003. Their goal was to create a space that is well appointed and tastefully decorated so every family feels immediately welcomed and at home. 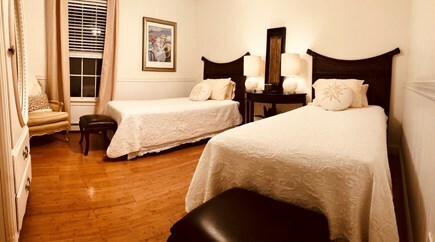 Their greatest joy is knowing that wonderful lifetime memories are created and they feel they share part of that joy in offering their home as a comfortable base camp for their guests to enjoy the magic of Cape Cod. What's quite interesting is how the Ferri's came to settle in Harwich! After several years of searching the lower cape for a plot of land that felt right and met their requirements, they literally happened upon this neighborhood as a 'last resort' before moving their vacation home sights to New Hampshire. The area ''Just felt right'', reminisces Jane, as they came down Bassetts Lane. As the home was underway with it's construction, Jane took a walk to Pleasant St beach and came upon a name plaque with her maiden name. Curious, she remembers calling her father and inquiring about where they vacationed when she was a youngster. That area turned out to be Chase Street (a mere 2 blocks away) where she and her family vacationed every year until she was 9 years old. That plaque indicated her great uncle's house (still in the family) located less than 1/8th of a mile away. Pleasant Street Beach was her summer playground for almost a decade for she and her family. They have come to feel that this land was waiting for them to arrive, to imprint the area with many wonderful memories for generations to come, not just within their family, but to share with others. Harwich is a very special town on the Cape. There are many wonderful Nantucket Sound Beaches to explore, play and rest seaside. Harwichport bustles with merchants and restaurants for every taste. 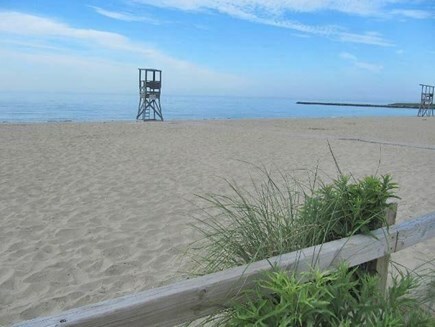 The town is situated an easy drive to Chatham only 10 minutes away or Provincetown, a scenic 45 minute ride. 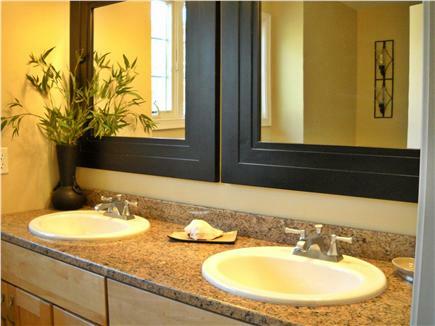 Hyannis to the West, is conveniently 20 minutes in the other direction with larger shopping venues.